Icom Inc. (アイコム株式会社, Aikomu Kabushiki-gaisha) is an international manufacturer of radio transmitting and receiving equipment, founded in 1954 by Tokuzo Inoue with the company's original name being "Inoue". Its products now include equipment for radio amateurs, pilots, maritime applications, land mobile professional applications and radio scanner enthusiasts. Its headquarters are in Osaka, Japan, with branch offices in the United States (in Kirkland, Washington), Canada (in Delta, British Columbia), Australia (Melbourne, Victoria), New Zealand (Auckland), the United Kingdom (Kent, England), France (Toulouse), Germany (Bad Soden), Spain (Barcelona) and the People's Republic of China (Beijing). IDAS is Icom's implementation of the NXDN protocol for two-way digital radio products intended for commercial Private Land Mobile Radio (PLMR) and low-end public safety communications systems. NXDN is a Common Air Interface (CAI) technical standard for mobile communications. It was developed jointly by Icom and Kenwood Corporation. The D-STAR open radio system was developed by Icom based on digital radio protocols developed by the Japan Amateur Radio League and funded by the Ministry of Posts and Telecommunications. This system is designed to provide advanced voice and data communications over amateur radio using open standards. An amateur radio station comprising three Icom radios. Icom manufactures two way radios and receivers for use in marine applications, Airband, amateur radio applications, land mobile applications, and FRS / GMRS applications. Some radios made by ICOM are compatible with Motorola and SmarTrunk trunking systems. ^ "Company outline". ICOM Inc. Retrieved November 21, 2018. ^ a b Vigil, Sam (August 2001). ""Mr. ICOM," Tokuzo Inoue, JA3FA". 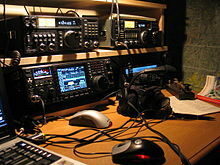 CQ Amateur Radio. CQ Communications, Inc.: 22–26. ISSN 0007-893X. ^ Progri, Ilir (January 15, 2011). Geolocation of RF Signals: Principles and Simulations. Springer Science & Business Media. p. 116. ISBN 978-1-4419-7952-0. ^ Ford, Steve (2008). ARRL's VHF Digital Handbook. American Radio Relay League. p. 41. ISBN 978-0-87259-122-6. Wikimedia Commons has media related to ICOM. This page was last edited on 30 March 2019, at 02:32 (UTC).